Mandatory inspections - Carl Stahl - løftegrej, stålwire, kædesæt, rundsling m.m. The legislation lay down a set of demands for inspections of material that can compose a risk to people or surroundings. The inspections must ensure that the material are always in secure state of repair and is in accordance with the regulations. At CARL STAHL A/S, our well-equipped test- and service vans cover the nation and perform controls and tests of all kinds of lifting material in accordance to the working environment authority’s announcements and specifications. CARL STAHL A/S is a member of Kranbranchen. Our service technicians have the 3-year certification from Kranbranchen, and all of their inspections are based on the requirements of the law. Furthermore, all of our service technicians regularly undergo further training. Visual inspection of chains, wire straps, hooks, slings and shackles, etc. 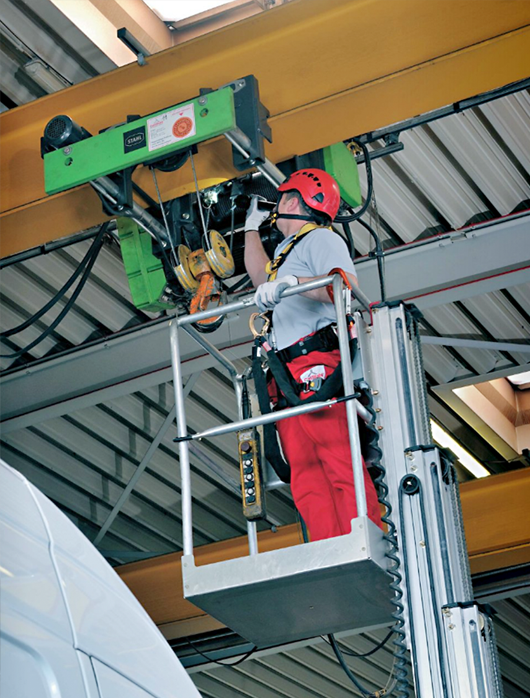 Any inspection is ended with all of the approved lifting equipment being tagged with loading signs or a color code, and if possible, an RFID-tag. Finally, a valid certificate that proves completed tests and checkups is provided. All test results are transferred to our online portal where you have unlimited access to print the certificates, documents, and technical data that are registered to your equipment. Furthermore, our service technicians are authorized to control and inspect fall protection equipment, as well as mandatory inspections of storage shelving units, pallet racks, scaffolds, and ladders. Contact us by phone +45 76 24 02 34 or by email info@carlstahl.dk and learn more about how we can help you.